Gluten-free is a trend that isn’t going away with so many people discovering either celiac disease or gluten sensitivity. That is why is a good idea to have some gluten-free Thanksgiving recipes on hand when planning for the big Thanksgiving Day meal on Thursday, Nov. 23. Celiac disease and non-celiac gluten sensitivity are common disorders of gluten intolerance. Such conditions can wreak havoc on the body and produce annoying symptoms such as fatigue, headaches, hair loss, skin problems, and especially digestive issues like abdominal pain, bloating, gas, diarrhea, and constipation. It is a good idea to plan for your guests with food sensitivities or dietary restrictions like gluten. That is why I’ve created this gluten-free Thanksgiving menu for those of you cooking a group of people intolerant of gluten. Cooking without gluten can be quite complicated when you don’t know what you’re doing. A gluten-free diet is more than just avoiding grains like wheat. There are actually a lot of surprise foods that contain gluten. Certain types of alcohol like beer also contain gluten. For your Thanksgiving meal, be sure to avoid store-bought stuffing, bouillon cubes, gravy, and salad dressings, which all contain gluten. What should you include in your gluten-free Thanksgiving recipes? Foods that are safe for a gluten-free diet include potatoes; quinoa; rice; teff; millet; corn; buckwheat; arrowroot; amaranth; sorghum; gluten-free oats; nut flours; and nuts and seeds. Believe it or not, it is possible to make nearly everything gluten-free on your Thanksgiving table, including the stuffing, gravy, and pumpkin pie. But to do so, you just have to get a little creative when you make a large meal from scratch. When you get your turkey from a farmer that sells grass-fed turkeys without antibiotics and steroids, it is hard to go wrong. Some store-bought turkeys contain added spices, broth, and stuffing. Unless it is a gluten-free turkey, it is best to purchase your turkey from a trusted source like a farmer. You may be used to stuffing with Thanksgiving; however, gluten-free stuffing is also possible by using gluten-free breadcrumbs or even cauliflower. When you add spices, make sure you use fresh herbs or dried herbs from a trusted store or company. Potatoes are naturally gluten-free, so there’s no reason mashed potatoes need to contain gluten. Some instant mashed potato brans are gluten-free; however, you are always better off making your own. For gluten-free vegan Thanksgiving recipes, you can also use almond milk and some olive oil. Mashed cauliflower is a great and easy mashed potato alternative as well. Many of us know how to make gravy with turkey pan drippings and wheat flour. However, it is very easy to make gluten-free turkey gravy without flour. You can also purchase gluten-free gravy mix packages from the store. Your cranberry sauce doesn’t need to contain gluten, especially since several brands are gluten-free. Rather than buying store-bought cranberry sauce, you can also make your own. Sweet potato recipes can also easily be gluten-free while being made without flour. There are a lot of possibilities when it comes to sweet potatoes: pie, soufflé, or even candied. Your Thanksgiving meal doesn’t need to include dinner rolls, but if you can’t do without them, there are gluten-free dinner rolls available. You can also try making a gluten-free cornbread recipe instead. Many health food stores and some grocery stores will offer gluten-free pumpkin pies or gluten-free pumpkin piecrusts. For the pie filling, there are also pure pumpkin fillings that are gluten-free. Also, make sure you use gluten-free spices from trusted sources. 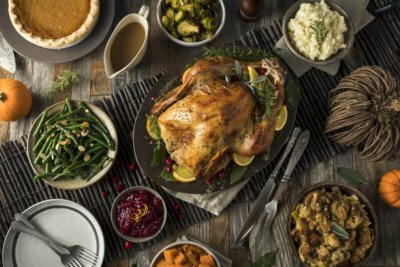 When you prepare ahead and know what to do, a gluten-free Thanksgiving dinner is actually quite simple. Let me help get you started. The following are main, side dish, gravy, and dessert recipes that will make your gluten-free Thanksgiving meal a lot easier. The gluten-free main dish is the main attraction of the whole dinner. To accommodate both vegans and turkey lovers, I have provided a turkey recipe and a gluten-free vegan recipe. Here is the best turkey recipe with a gluten-free rub, and a vegan glazed lentil walnut apple loaf that even the meat-eaters will enjoy. Combine all brine ingredients and stir well. Combine all the turkey spice rub ingredients, and blend well. To make the final turkey, use brine overnight, and the next day, pat it dry. Preheat the oven to 450°F. Coat the turkey with a fat like olive oil or ghee, and spread on the spice rub liberally. Place the turkey in a large roasting pan and put it into the oven. Roast on high heat for about 20 minutes. Turn the heat down to 375°F, and roast until it is golden and juicy for about one and a half hours. Take the internal temperature up to between 175° and 180°. Once done, take the turkey out of the oven, and let it rest for about 15 minutes. Carve the juicy, golden turkey and enjoy! Preheat the oven to 325°F. Rinse and strain lentils, and place into a pot along with three cups of water or vegetable broth. Bring it to a boil and season with salt. Reduce heat to medium low, and simmer uncovered for about 45 minutes. Stir frequently and add some water when needed. Mash the lentils with a spoon when ready. Toast the walnuts at 325° for about eight to 10 minutes. Set it aside and increase the oven temperature to 350° F.
Whisk the ground flax with water in a small bowl and set it aside. Heat a teaspoon of olive oil in a skillet over medium heat, and sauté the onion and garlic for about five minutes. Season with salt and add the diced celery, apple, shredded carrot, and raisins. Sauté for another five minutes, and remove from the heat. In a large mixing bowl, combine all ingredients, and adjust seasoning to taste. Grease a loaf pan and line it with parchment paper. Press the mixture firmly into the pan. Whisk the glaze ingredients and spread it on top of the loaf. Reserve the rest for dipping sauce. Bake it at 350 for 40 to 50 minutes, uncovered. The edges will be lightly brown. Cool it in the pan for at least 10 minutes, before you transfer it to a cooling rack. Slice it only when the loaf has cooled. Gluten-free Thanksgiving side dishes can help complement the entire meal. It can be quite difficult to make a gluten-free stuffing or potato dish if you don’t know the steps to take. I have provided my best gluten-free stuffing recipe with cauliflower and a healthy garlic and herb smashed potato recipe. In a large skillet over medium heat, melt the ghee. Add the onion, carrot, and celery, and sauté until the mixture softens. It will take about eight minutes. Add the mushrooms and cauliflower, season with pepper and salt, and cook until it is tender for about five to 10 minutes. Add sage, cilantro, parsley, and rosemary, and stir until combined. Then, pour over vegetable broth. Cover with a lid until everything is tender and the liquid has been absorbed, for about 15 minutes. Over medium-high heat, fill a large pot with filtered water and add sea salt. Add the potatoes and cook until soft for about 15 minutes. When potatoes are cooking, melt your butter, ghee, or olive oil in a small pan, and add minced garlic. Cook for a minute or until garlic is fragrant, and remove from the heat. When the potatoes are done, drain the water and add garlic, butter, almond milk, pepper, and sea salt. Blend everything with a hand blender until the desired texture has been achieved. A food processor or potato masher would also do the job. For chunky potatoes, stop mashing when you reach desired texture. Use a wooden spoon to stir in chopped herbs, pepper, and sea salt. Serve in a large baking dish. Gravy is that special sauce that helps bring all the flavors of your Thanksgiving meal together. For all those traditionalists out there, gluten-free turkey gravy is possible. In this section, I have provided a gluten-free turkey gravy recipe, as well as all-purpose vegan gravy. Chop the celery, carrot, onion, and garlic. Remove the giblets and neck from the cavity of the turkey and rinse them out. Melt ghee in a stockpot and add neck and giblets; brown all sides for a few minutes. Add chopped celery, onion, carrot, and garlic, and two liters of water. Simmer on medium-low heat for about an hour, or until you have three cups of broth. Turn the heat off. Strain the vegetables and discard, and carefully remove the giblets and neck. Three cups of broth should remain in the stockpot. Let the neck cool down fully. Peel the meat from the neck and add to the food processor along with the giblets. Pulse the mixture until it forms a thick paste. Add two cups of roast drippings to the stockpot. You will get about two cups of juice. Add the neck and giblet paste into the pot, turn it on high, and stir. Add cream or almond milk and continue to stir. Add a half-teaspoon of arrowroot flour and whisk; continue to add arrowroot flour until desired thickness. Once desired thickness has been achieved, add parsley and mix until ready to serve. In a blender or food processor, combine all ingredients and puree until smooth. In a pot on medium-high heat, add the mixture and bring to a boil. Reduce to low and stir frequently to thicken. Remove from the heat and serve. Add more water, vinegar, or agave if needed for taste. We always leave the best for last. What is Thanksgiving without dessert? Not much, as far as I’m concerned. I have provided two gluten-free Thanksgiving desserts for you to try. There is a vegan pumpkin pie recipe, as well as a paleo sweet potato pie recipe. I promise you that both recipes will have you coming back for seconds. Preheat the oven to 350°F. Place the almond flour, tapioca flour, and salt into a food processor and pulse four or five times for a few seconds each time. Add the butter, and one tablespoon each time, and process for five seconds until butter resembles coarse crumbs. Add the eggs and process until the dough comes together. Pat the dough into a nine-inch pie dish. It may take some time to press into the bottom and sides. Even it out and smooth the dough with the back of a spoon. Cover the pie crust with a sheet of tin foil, and bake in the preheated oven for 15 minutes. Remove the foil and bake for another 10 minutes, uncovered. Remove from the oven and let cool. Place the sweet potato puree in a food processor and add ginger, orange zest, cinnamon, vanilla, salt, honey, eggs, and coconut oil. Process until it is smooth and well blended. Pour the filling into the pie crust, and make it smooth and level. Bake in the oven at 350 for 65 to 75 minutes, or until the filling has puffed and is set. Remove from the oven and let it cool completely at room temperature. Refrigerate until cold. Place the egg whites in the bowl of a stand mixer fitted with a wire whisk. Beat until it softens. With the mixer running, drizzle the honey into the bowl, and whip on high until stiff peaks form. Place the whipped egg whites in a pastry bag with a star tip and pipe stars of meringue on the top of a chilled pie, covering the entire surface. Place under a broiler and broil just until the egg whites start to brown on top. Watch this closely as the browning happens very fast. Remove from the broiler and serve or keep chilled until you serve it. Grease a nine-inch pie dish, and preheat the oven to 350°F. In a blender, process your oats into a fine flour. In a food processor, add two cups of pecans and process until it starts to clump and oils starts to release—but make sure you don’t make pecan butter either. Melt coconut oil with brown rice syrup in a small pot, transfer it into a large bowl, and combine with the rest of the crust ingredients. With your hands, squeeze the dough to combine well. Spoon the pecan dough into the pie dish and smooth it out evenly. Press down with your fingers to form a crust, and bring it up along the sides. Press as firmly as you can, and prick the base with a fork 12 to 13 times. Prebake at 350 for nine to 12 minutes, and watch it closely so it doesn’t burn. Remove and cool it for 10 minutes. In a large bowl, whisk together the arrowroot powder and maple syrup. Add all ingredients and whisk it together; add more sweetener if needed. Scoop the filling into the crust and smooth it out. Cover the crust with a crust shield or tin foil, and bake for 50 to 55 minutes at 350 . Place on a cooling rack for an hour, and transfer to the fridge to let it set for three hours or overnight. Do not slice the pie until it has set in the fridge for a minimum of three hours. Slice it with a very sharp knife, and do so very slowly for the best results. Some crumbling may occur, but that is definitely all right. Enjoy. A gluten-free Thanksgiving doesn’t need to be difficult. Your turkey or vegan main course; side dishes like stuffing or potatoes; gravy; and desserts can definitely all be gluten-free. Creating gluten-free Thanksgiving recipes can be made easy, especially when you try many of the recipes included above—some of which are also vegan and paleo. It can be hard to accommodate all your guests, but with the provided these recipes, you will be one step closer to that goal. I ensure you that guests won’t be able to tell the difference. They will love the natural ingredients and creative nature of the recipes. So, pass the stuffing, pass the potatoes, pass the gravy, and enjoy your Thanksgiving! Balch, J., et al., Prescription for Natural Cures: A Self-Care Guide for Treating Health Problems with Natural Remedies Including Diet, Nutrition, Supplements, and Other Holistic Methods (Hoboken: John Wiley & Sons, Inc., 2004), 337-340. “Foods to Avoid on a Gluten-Free Diet,” EUAF; https://www.uaf.edu/files/olli/Foods-to-avoid-on-a-GF-diet.pdf, last accessed Nov. 14, 2017. “Gluten-Free Turkey for Thanksgiving,” Gluten-Free Girl, Nov. 18, 2009; https://glutenfreegirl.com/2009/11/gluten-free-turkey-for-thanksgiving/. “Glazed Lentil Walnut Apple Loaf, Revisited,” Oh She Glows; http://ohsheglows.com/2012/10/05/glazed-lentil-walnut-apple-loaf-revisited/, last accessed Nov. 14, 2017. Funston, L., “Cauliflower Stuffing,” delish website, Nov. 16, 2016; http://www.delish.com/cooking/recipe-ideas/recipes/a50127/cauliflower-stuffing-recipe/. “Healthy Garlic & Herb Smashed Potatoes,” Linda Wagner November 2013; http://lindawagner.net/blog/2013/11/healthy-garlic-herb-smashed-potatoes/index.html. “Keto Turkey Giblet Gravy,” My PCOS Kitchen, Oct. 30, 2017; https://www.mypcoskitchen.com/keto-turkey-giblet-gravy/. “Tick Tock, Racing Against the Clock,” Oh She Glows; http://ohsheglows.com/2010/10/04/tick-tock-racing-against-the-clock/, last accessed Nov. 14, 2017. “Paleo Sweet Potato Pie Recipe (Gluten-Free, Clean Eating),” My Natural Family; https://www.mynaturalfamily.com/recipes/paleo-recipes/paleo-sweet-potato-pie-recipe/, last accessed Nov. 14, 2017. “Pumpkin Pie with Gluten-Free Pecan Crust,” Oh She Glows; http://ohsheglows.com/recipage/?recipe_id=6006103, last accessed Nov. 14, 2017.